Need a fun and easy way to organize art supplies? Whether it’s for yourself or your kids, here’s a great idea you can use to keep arts and crafts supplies organized and portable. It’s like having your own mobile art station. And the best part? It’s easy and inexpensive! These are my kid’s art supplies, and while we do have a craft closet, many times Jack & Kate seem to want to draw or create while I finish up dinner or work on my blog or podcast. So I like to be able to travel around the house with our supplies, and this system works out great. Really, though, you could use this for any type of crafting: jewelry making supplies, scrap-booking, polymer clay… the list is just about endless. You can see that the best part is that there are plenty of pockets to accommodate crayons, scissors, painting supplies, you name it. Plus, it helps keep things organized in a fun way. Each item has it’s own little pocket. I think this has taught the kids to not only want to pick up after themselves and keep their items organized, but to be more innovative when trying to find ways to organize and keep their items in one place! 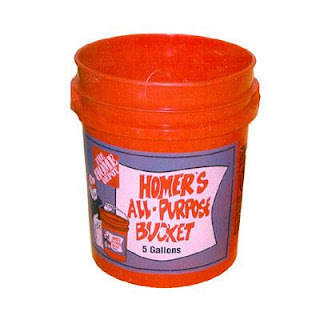 These buckets can be found right by the front door of any Lowe’s or Home Depot for around $2.50. That’s a hard deal to beat – you may want to grab an extra one or two for any other uses or projects. 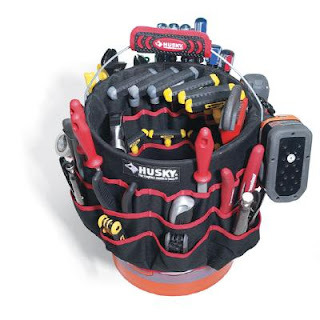 A bucket jockey is made to hold all sorts of tools and is filled with pockets just the right size for scissors, pens and pencils, and any other art supplies. These run around $10, so really for about $12 you can have your own portable art system to pull out any time the need to create hits you or your family. Isn’t it sometimes hard (especially if you’re traveling) to keep all the littlest items in one place? They’re easy to lose and you just end up buying more supplies. This way, I’ve found that we hardly ever lose items and we don’t create a big mess around the house!